As my journey started to evaluate the performance of CPB Camps for outof school children at various schools, I started penning down much of the happenings virtuously related to the educational domain. Upon reaching Multan, I foundthat the progress with regard to CPB was pretty much satisfactory since CPB Camp had already entered into its last phases of Final Assessment. I ensured that the final assessment was accurate and without any ambiguity. Series of an interactive sessions were conducted with the students and therefore an improvement in their overall educational portfolio was observed. I couldn’t wait to reach Muzaffargarh and there found out that the output of CPB Camps were aligned as per the preliminary defined targets.Enthusiasm and passion made me interact with the students and I got the chance to find some inspiring stories. One of them is worth writing about. Gulshan is a resident of Khoji Wala, Jagatpur village, Muzaffargarh who used to be a beggar by profession. Her parents and siblings are still part of this ruthless profession as it is the only way for them to earn a living. When ITA initiated with its comprehensive survey to identify the out-of-school children, Gulshan’s residence was also approached. Upon inquiring it was revealed that Gulshan and her siblings have never been to school before. Survey team as per the defined strategy endeavored to convince her parents to gettheir children enrolled to schools for their betterment. But, only managed to have Gulshan registered for CPB Camp which is being held at Govt. Girls Elementary School, JaggatPur. As Gulshan never liked to go for begging, her dream to get educated came true by joining CPB Camp. On her very first day, she was so excited that she woke up early morning and reached school on time. Teachers at school welcomed her and conducted the baseline assessment. Results unveiled the fact that she fell in the category of Beginner for all subjects. Basically, baseline assessment for CPB consists of three subjectsi.e English, Urdu and Arithmetic. Every student gets individually assessed and students are divided in groups accordingly. During my recent tour to Muzaffargarh on November 19th, 2015, I was curious to know about Gulshan’s results. It was shocking for me to witness the improvement in learning levels of Gulshan in just 45 days. In English and Urdu, she could now easily recognize “Words”, and in Arithmetic she could now easily solve upto “Single Digit Division”. Her teacher shared that she rigorously participates in the activities of CPB Camp. Despite belonging to a family who is completely illiterate, she was eager to learn and acquire knowledge. With the help of CPB which is an accelerated learning program, Gulshan upon at its completion can now be enrolled at any school in Grade 1. 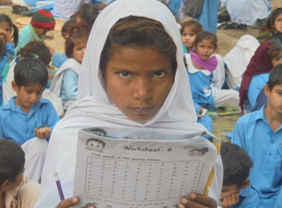 Gulshan is now determined to pursue her education. She dreams to become a teacher one day.